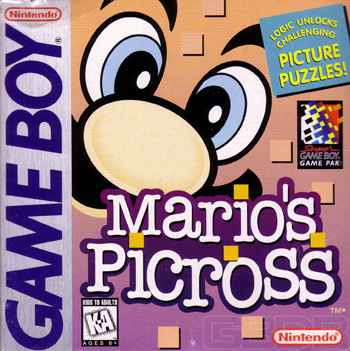 Help Mario unlock the mystery of Picross! The secrets lie in the numeric codes on the top and left side of the window. Deciper (sic) these numbers and uncover a hidden picture in each mind-bending puzzle! 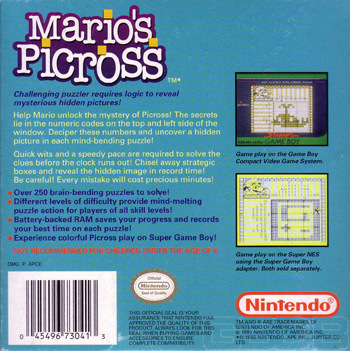 Different levels of difficulty provide mind-melting puzzle action for players of all skill levels! Battery-backed RAM saves your progress and records your best time on each puzzle! 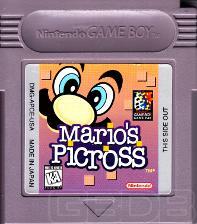 Experience colorful Picross play on Super Game Boy!